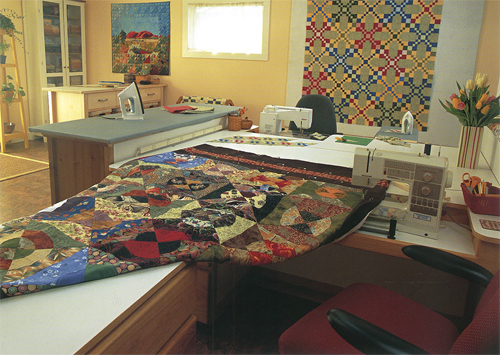 Like many quilters, I used to dream of having a space set aside just for my quilting—a place I could call my “studio.” In my case, I dreamt of a space large enough for two, since my husband is a quilter, too, with his own machine and an equally large and unruly fabric stash. 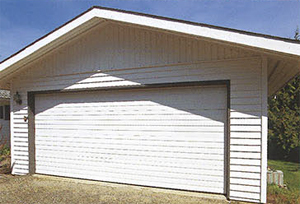 When we moved into a home that had two two-car garages (one whole garage more than we needed, shown at right), we began to think about how we might convert that space to a quilt studio. We sketched out pages of quilt-room design ideas and discussed how it might all work. 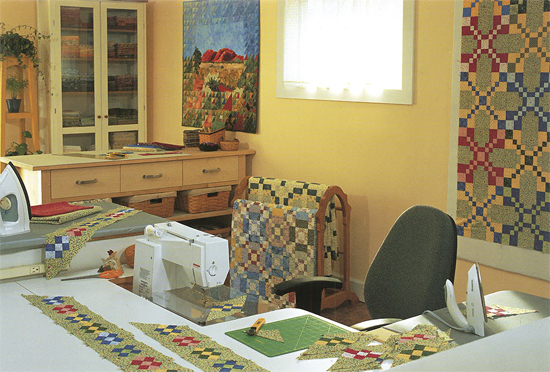 But it wasn’t until we had the opportunity to be one of the ten makeovers designed by Lois Hallock for her book Creating Your Perfect Quilting Space, that we started seriously researching designs for sewing rooms. We were so excited! It took us eight months of working nearly every weekend, but isn’t it fabulous? And you know what? Eight years later, we still love it. We wouldn’t change a thing. Well, maybe just one little thing: we positioned the lights over the cutting tables a little differently than Lois recommended, and we know now we should have listened to her. Sigh. Why did we think we knew better? They’re okay and we have plenty of light for cutting, but it would have been just a teensy bit better had we followed her advice. Otherwise, aside from the fact that the room hasn’t been this neat since the photos were taken, it looks pretty much the same. More important, it still works well, and I’m confident we spend more time there than we ever would have if we hadn’t undertaken such an extensive makeover. In the process of creating our perfect quilting space, I learned so much from Lois about what’s important in any work space. Considerations such as adequate lighting, ideal cutting-table height, and proper chair adjustment are covered in many books and articles. 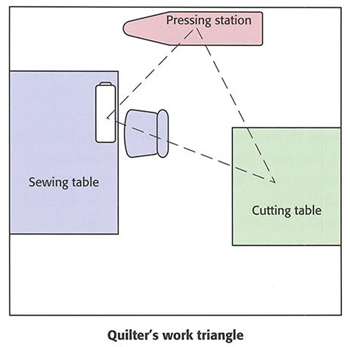 But did you know that the principle of the work triangle used in kitchen design can be applied to sewing-room design? 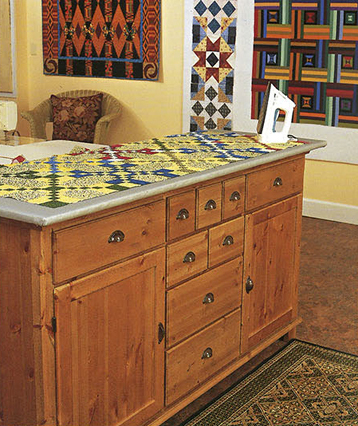 Anyone can set up a work triangle, whether you’re sewing in a big studio or at your kitchen table. 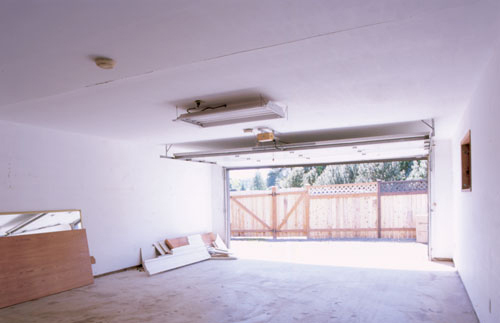 Plus, it can work for both permanent and temporary spaces. Did you also know that a comfortable ironing height is about 3″ taller than a comfortable cutting height, because an iron is heavier than a rotary cutter? How about the fact that some full-spectrum lightbulbs—the kind that render color accurately—can also fade your fabric, just like natural sunlight can? Storage pieces and work surfaces come in all styles and price ranges, from repurposed bedroom dressers to kitchen cabinets from Home Depot or Ikea to custom furniture. Keeping tools and supplies organized and within reach saves time and energy, allowing you to spend less time searching for your missing seam ripper and more time being creative. Proper lighting is essential to avoiding fatigue and eye strain, but most of us don’t realize that our lighting levels are too low. A person at age 40 may require twice as much light as a person at 20 (ouch!). 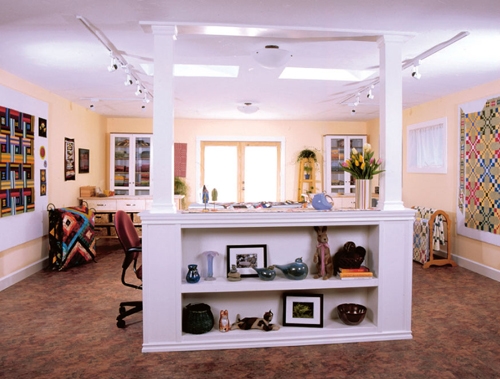 Increasing the amount of light, especially task lighting, can allow you to work more comfortably for longer periods. 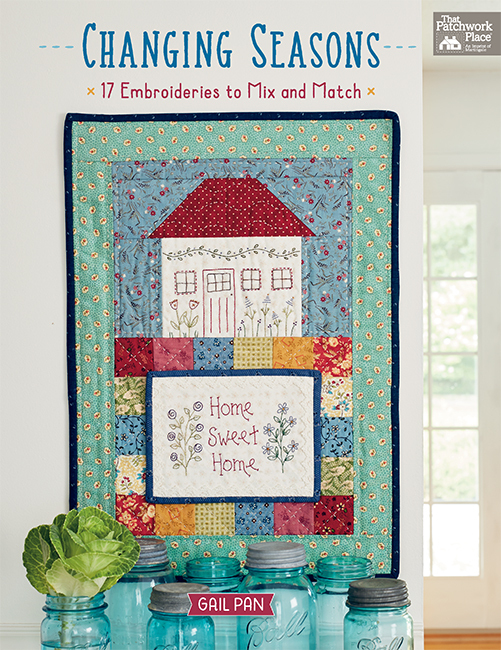 Whether you sew in a corner of the bedroom, on the dining-room table, or in a large, dedicated room, there are tips and ideas here that will help you be more organized, work more efficiently, and enjoy your quilting and sewing more than ever. You may even decide to take the plunge and plan your own makeover! 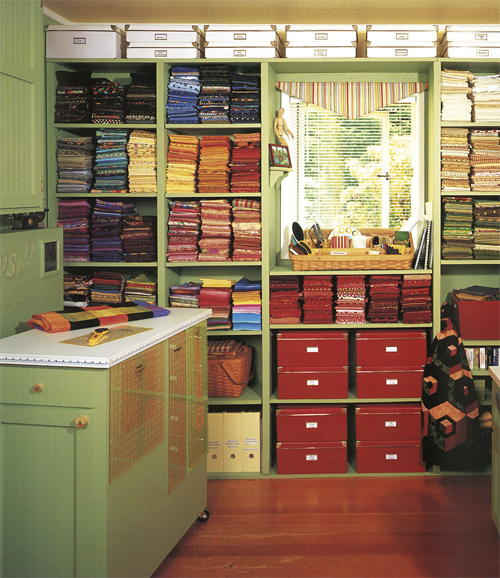 How do you organize and store your fabric? Share your best ideas—or your biggest challenges—in the comments! Check out the slideshow below for even more ideas from the book; then take advantage of this week’s special sale. Typically, bookcases aren't deep enough to store folded fabric efficiently, but if you can remove a shelf or two, they're perfect for housing fabric bolts. A purchased buffet offers something ironing boards don't--lots of bulk storage! Simply add a homemade top covered in heat- and moisture-resistant fabric. 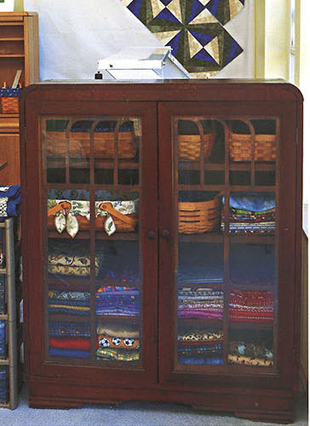 A vintage cabinet recycled from the garage now displays neatly folded fabric and baskets for tools and scraps. 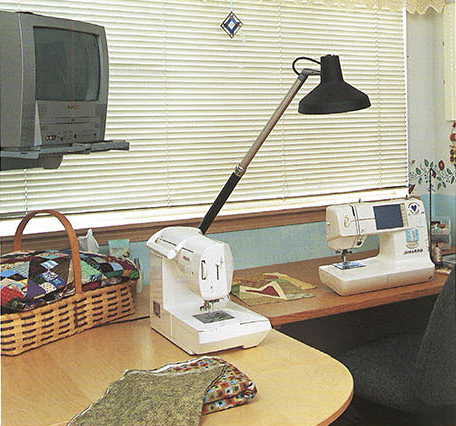 An articulated task lamp makes it easy to direct additional light on either the sewing machine or the embroidery machine in this studio. 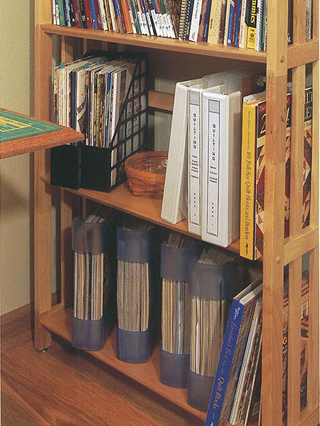 Store magazines in plastic or cardboard holders in your bookcase. You can generally store a year's worth of each subscription in one folder. Divided baskets are a good way to organize fat quarters and scraps. 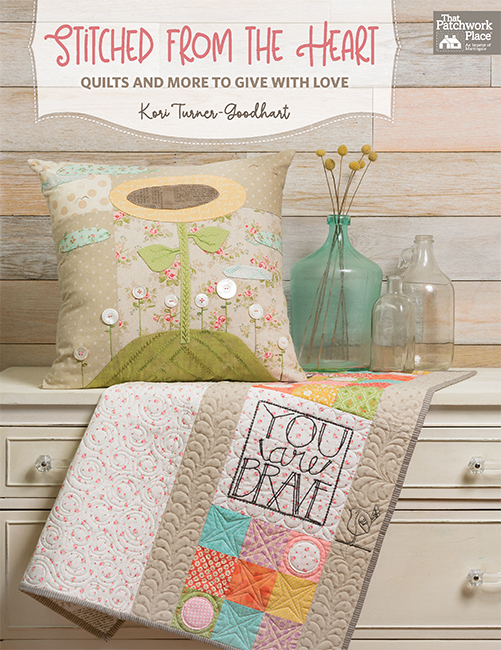 6 quilt tutorials—free from our authors! I store mine in the typical IKEA wire storage drawers. Everything in my studio room is modular, so I can take it all apart and move it around to suit my current needs. Right now I’m on incarnation #2 of my workspace. the yardage, the sku number/ collection/ manufacture, store where and when purchased, whether washed or not, what project fabric is to be used in,photo copy of pattern, or line drawing and any other information I may think I need to remember. This is then stapled on a selvage edge. Color coordinate, stacks stay even, lots of work at the start but time saving when searching for the fabric needed for a project when the inspiration happens. I work in a fabric store. Now that I am a bit older, I realize that buying large cartons to store fabric is not the best idea, buy smaller cartons that are easy to lift at any age. The clear cartons that you can see through help also. With fabric, because of allergies, I usually wash and dry and press and label all new fabrics I purchase before it is stored. Pinned on Label includes: yardage, w & d (washed & dried) from what store, location, and date. Over the years, this has belped so much. When I pick up my fabric from stash, I know immediately if I can buy more and where because of label. The extra time used is a good trade off for NOT running out of fabric needed for a project = panic prevention. My studio is a large room in the basement. Because of an accident with water in the yard a number of years ago, I had to do some repairs. When I was finished, all the walls are white, all the floor to ceiling cupboards are white, and the lights are finished in the ceiling. Because I live in a dusty part of the country and have fabric-loving cats, my fabrics are stored in Rubbermaid containers (clear). I have stuck a Post-It on the outside: cool FQ, warm FQ, particular theme, Christmas, or particular colors. Some fabrics set aside for a given project are folded together with one fabric for the project wrapped around the whole collection. I have a cutting table on saw horses that are waist-high, and sew on a corner computer table. I purchased white bookcases that are stacked on top of the built-in desk, and bridged with additional shelves. These are for books, and containers of patterns and tins I corral odds and ends in. 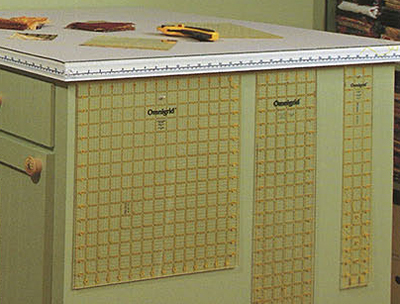 I also keep patterns in Rubbermaid containers (sewing patterns)and those are under the cutting table. It would be nice to move the queen bed out, but that isn’t possible at the moment. I haven’t been able to do my annual magazine sort, and clean up but when it is done and everything where it should be, I love working down there. I don’t have the luxury of having a big studio to sew in, so with limited space in a 3 BR and 2 bath home, I had to resort to stackable Sterlite and/or Rubbermaid clearview, mostly 56 quart size, containers with lids. Each container has its own fabric color or fabric subject, as in transportation, children, flannel, Christmas, etc., and each container is clearly marked on both ends. Fabric is neatly folded and at a glance, I can see what’s inside. Rarely do I have to open a container to see its entire contents. Each state has different climates and storage like this, in Florida, has never had any side effects. My smaller individual plastic storage boxes house my thread, notions, patterns, UFO’s, and I have a wall built in bookcase and 2 fabric bolt racks, along with my cutting table, 2 sewing machine tables, and ironing board. For my "FREE" patterns printed off the Internet, I use durable notebooks and plastic inserts, and I have two huge containers marked "To Be Quilted" that house my completed pieced tops, backings, and pre-made bindings. I have 4 ruler racks on a table with mounted shelving above that houses individual boxes labeled Projects. All of this, is stored, in our Family Room and one Bedroom. In our community bathroom is a quilt magazine rack, and our secondary bedroom houses batting. My husband and I are both, Quilters, and between us, we have 8 machines, including a long arm. I have 2 Tutto bags: 1 houses my "to go" machine and notions, while the other houses all my projects I’m working on, and I usually carry two for retreats. Our master bedroom (and bath) has its share of hand work projects. Nothing goes to waste in our home. Studios? Who needs one? Oh so many challenges, I’ve been "accepting" empty bolts from fabric stores and filling them w/fat q’s or big chunks of leftover fabric-it’s not working out all that well. I have a room and 1/2 to dedicate but so far it’s hodge podge and dig around and move boxes to get to something I want-that’s if I remember that I have it. Kudos for the diligent organizers, labeling and storing-I’m a work in progress and hope to make more progress soon. As always, thanks for picutres, details and sharings. I recently converted my 2 car garage into a large quilting room and I contracted with a cabinet shop to build lower cabinets with drawers and shelves and upper cabinets with glass doors. My fabrics are sparated and folded by color to go on the selves in the upper cabinets so I can easily find the colors/fabrics that I need for my project. I also splurged and purchased a long arm quilting machine (computerized)so now I spend much of my spare time in my "heaven on earth" space. I used the Quilting Room Space Makeover book to help me make my new room the best it could be! I found that stacking all my fabric, folded and in view, on shelves was the best motivation for me with my sewing. All fabric is easy to see and readily accessible. To keep the dust out I put clear glass doors on the shelves so everything was still visible. I find I am now using my stash far more effectively. A friend’s huband got her a studio apartment for her sewing room. I have a 20 drawer chest; the drawers are the perfect size for my folded fat quarters. Like most quilters, however, my fabric stash is too large for any one container, or room, and I also have several large plastic storage containers around the house. One day I had my son take one down from a high shelf and discovered so many things I’d forgotten I had! I’m not talking about (just) yardage – I had quilt tops in there too!! It now sits in my living room and will remain there until I finish those UFO’s. Parabéns Maria por ser este espaço tão prático. Obrigada pelas idéias de todas. Congratulations Maria for being this space so practical. Thanks for the ideas of all. I have the 5X5 Ikea storage cube system. I have purchased both plastic bins and basket-style bins also from Ikea to slide into the 12″X12″ cubbies. I have grouped my stash by color – each bin has a different color in it, and one for black-on-black, one for white and black prints. Some cubbies also have batiks, some have multi-color prints,some store current projects or store a particular fabric I may be collecting for a future project. I can slide out the bin I need, get what I am looking for, then slide it back in. I LOVE my Ikea system. I really works for me. When I retired, I added 12 feet to my extra bedroon so now have a 25 x 14 foot room – I spend most of my time in that room. 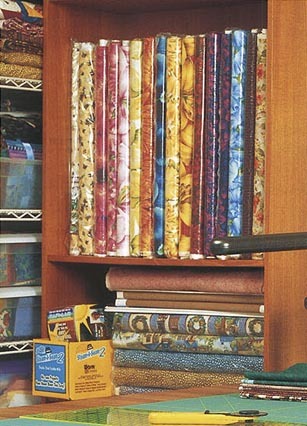 I store my fabric on mini-bolts (piece of cardboard 7″ x 11″) and put them in book shelves – easy to see what I have and easy to pull out or put back – I store my fat quarters in a shoe storage rack – I fold the fat quarters to fit (about 3 1/2″ x 9″). I can fit a stack of about 25 to 30 fat quarters in each cubby hole. I have one row of half yard cuts that I have folded the same way. It’s easy to pull out a stack, take what I want and put the stack back. Scraps are stored in clear plastic shoe boxes, and labeled according to size. When I get stuck with a sewing project, I get out my scraps and play. There’s no "set" formula-it all depends on your individual set-up. 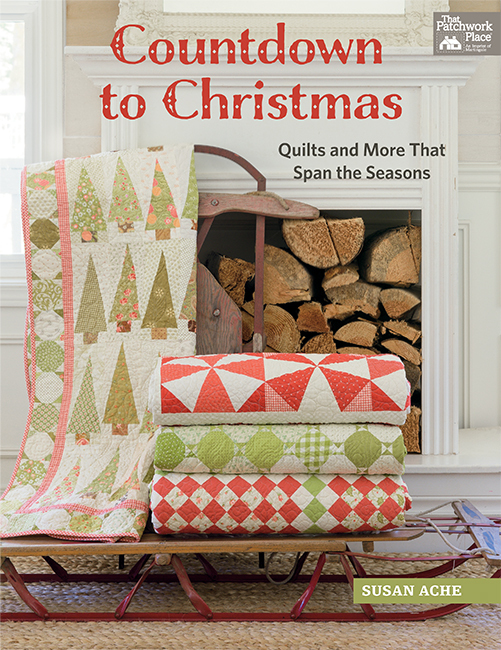 Lois devotes several pages in her book to the ergonomics issue-plus there are tips and tricks shared in each individual quilt studio story. My husband purchased the book years before I began quilting for my garment fabric stash. We created my "studio" when our son was in college and wasn’t supposed to return. LOL. My suggestion: Measure fabric by yards and fold in half as you go, accordian style not wrap-around. The folds will create yards. At the end fold the 18 into 9inch and the WOF into half for a bundle approx 9×11 Easy to see yards and count for remainging after slicing off for a current project. My stash is folded into clear bins by categories of my choosing. Inside each side of the bin is a post-it (written on the sticky side attached to the INSIDE readable to the outside) so they don’t fall off. Bins are on a metal rolling rack (CostCo) and the labels mean I can store any side outward. More bins under my cutting table! FQs have shallow bins (no label on fabric) sorted into colorings. I also do a bi-annual full inventory which is Excel and photo cataloged, but that’s my OCD – LOL. Hello, I pondered the question of fabric storage for many hours and searched high & low online for some clue as to a way to store my "ge-sades" of fabric in a way that would make it easy to see, remove and replace. Having collected antique books and such, I am sensitive to the idea of acid free storage. After all this thought, my aha! was to purchas the comic book sized acid free cello bags and place my fabric into these bags. When purchased by the 100, they are not very expensive. This allows me to include a piece of acid free paper (scrapbook stock) to describe the quantity of fabric & any grouping to which it might belong. I have decided in many cases to go to the added expense of wrapping the fabric around pieces of acid free cardboard that is, again, used by comic book collectors to give to pieces some rigidity. This adds to the cost because the cardboard is heavy to ship. I have purchased some comic book storage boxes, but also have a large number of plastic drawers. In addition, I bought smaller cello bags for fat quarters that fit into DVD cases and have purchased some of these as well. Now just to get busy & put it all together. One big benefit is the protection from dust and light. I hope this idea helps some of you. I think it will work pretty well for the compulsiveness in me. I have two book cabinets to hold my collection of books and magazines. I use labeled notebooks to hold the quilts magazines using sheet protectors, turned to pattern that I would like to make. For I rip out of the magazine the best patterns. There is also magazines holders. 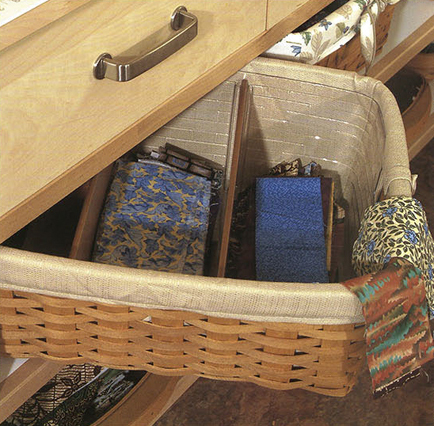 For my fabric I use pan drawers and kitchen cabinets. For small loose scrapes, the big Rubbermaid tubs, labeled by seasons or colors.I have been working on buying no more fabric until 75% of the fabric is used. This way I know what I have and what I really need. Nancy, I have sewing desk that was special made 28-30″ height, with top two yards long (72″) by 30″ deep. Made so I could use it to sew and cut. Flat, smooth sheet of Formica. My machine just sits on top. Nice to use for machine quilting. Portability and accessability are the key! the big plastic bins that I used to use got too heavy to move around so I now have the plastic bins that are actually 3 drawer units. I got them at Walmart. So easy to open and close and with the fabric Being enclosed it stays clean. The drawers can be organized by color, theme, etc. I have a novelty print drawer, fall colors, florals, etc. When a drawer gets messed up it is not overwhelming to refold a small drawer. I did try stacking two of the units but the weight was too much for the unit on the bottom and cracked it. I have clear shoebox size bins with the little scraps, again easy to pull off a shelf and go thru. The big bins hold only the stuff I rarely access and should pitch! I recently went thru my stacks of quilt magazines and ripped out the patterns or photos I would realistically ever want to make. Those torn out pages went in clear plastic sleeves and inserted in a binder. 1 Binder instead of a shelf of magazines! I have bagged each UFO so when I do get back to it, I wont waste time looking for some errant binding or pattern page. I had to move out of my house in August for a remodel project. Hoping to gain a sewing room when we move back so have really enjoyed the timeliness of this article and everyones suggestions. Nothing like having to handle and move all your quilt supplies to realize a halt on shopping needs to occur! Finally I think I have come up with a nice idea. I was getting rid of some old file cabinets. I now file my materials in them. All I have to do is think what color I need and go to that drawer. I struggled with quilting in a small bedroom, but finally have it about worked out. I have two "Bankers" bookcases with glass doors on the shelves, and in them is all of my fabric folded and wrapped on to 8 x 11 comic book cardboard pieces (Amazon sells them). By folding the fabric, it fits nicely into the bookcase’s shelves, and I can stand them all up and see exactly what fabric I have. It’s like looking at a rainbow. Background fabric and backing fabric I keep in my bedroom’s closet, marked with a Post-it note, so I will know how much is there. I have a rolling craft cart (Amazon again) that I use for the current projects. With space at a premium, I forces me to finish projects and not let them accumulate.